Immunoprecipitation of extracts from NIH/3T3 cells, untreated or PDGF-treated, using Phospho-Akt (Ser473) (D9E) XP® Rabbit mAb (Sepharose® Bead Conjugate) (lanes 3 and 4). XP® Rabbit IgG (DA1E) mAb Isotype Control (Sepharose® Bead Conjugate) #3423 was used as a negative control (lanes 1 and 2). The western blot was probed using Phospho-Akt (Ser473) (587F11) Mouse mAb #4051. Phospho-Akt (Ser473) (D9E) XP® Rabbit mAb (Sepharose® Bead Conjugate) immunoprecipitates endogenous levels of Akt only when phosphorylated at Ser473. This Cell Signaling Technology (CST) antibody is immobilized via covalent binding of primary amino groups to N-hydroxysuccinimide (NHS)-activated Sepharose® beads. Phospho-Akt (Ser473) (D9E) XP® Rabbit mAb (Sepharose® Bead Conjugate) is useful for immunoprecipitation assays. 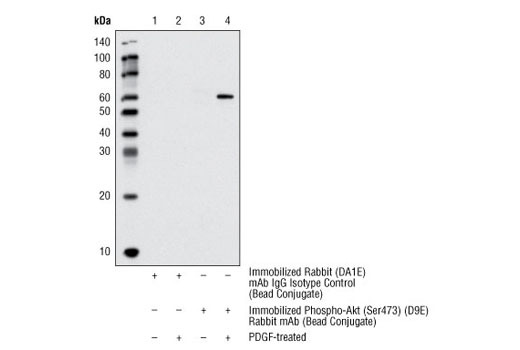 The unconjugated Phospho-Akt (Ser473) (D9E) XP® Rabbit mAb #4060 reacts with human, mouse, rat, hamster, Drosophila melanogaster, bovine and zebrafish phospho-Akt protein. CST expects that Phospho-Akt (Ser473) (D9E) XP® Rabbit mAb (Sepharose® Bead Conjugate) will also recognize phospho-Akt in these species.